CHILDREN'S READING PROGRAM: At 3:30-4:30p, at Library (in the Children's Area), 1118 Main. www.blancolib.org. 830-833-4280. Sunny waits to hear you read! PLANNING & ZONING COMMISSION: At 6p, at Byars Bldg, 308 Pecan. BLANCO HISTORIC PRESERVATION COMMITTEE: At 6p, Byars Bldg, 308 Pecan. An arm of the City of Blanco. Retta Martin, 830-833-4270. EXTENSION EDUCATION ASSOCIATION-RANCH HIWAY (& Blanco): Usually 2p, at various locations. 830-868-7167. Contact: Gretchen Sanders, Blanco County Extension Agent, Texas Cooperative Extension, Blanco County. BLANCO VOLUNTEER FIRE DEPARTMENT MONTHLY BUSINESS MEETING: At 7p, at Fire Station, 5th & Pecan Street. Public invited. Training meetings all other Tuesdays. EXTENSION EDUCATION ASSOCIATION-CHIMNEY VALLEY (& Blanco): Usually 2p, at various locations. 830-868-7167. Contact: Gretchen Sanders, Blanco County Extension Agent, Texas Cooperative Extension, Blanco County. BLANCO COUNTY CAT COALITION: At 6p, at Blanco Library. www.blancocountycat.org. 512-318-5875. Meetings are open to all. TNR program, adoptions, service, information. KNIGHTS OF COLUMBUS COUNCIL #14844: At 7p, at St. Ferdinand's Church, 29 Main Street. ALCOHOLICS ANONYMOUS: At 8p, at St. Michael Episcopal Church, 120 Singleton Dr., 830-885-4174. THE BLANCO BOOK BUNCH (WOMEN'S BOOK CLUB): At 2p, at Library (in Small Conference Room), 1118 Main. www.blancolib.org. 830-833-4280. OLD BLANCO COUNTY COURTHOUSE PRESERVATION: At 7p, at Old Courthouse. www.historicblanco.org. BLANCO RODEO ASSOCIATION DIRECTOR'S MEETING: At 7:30p, at Yett Park Arena. BLANCO MASONIC LODGE AF &AMP; AM NO 216: At 7:30p, at 11th & Main. Dinner @ 6:30p, Meeting. 830-833-4164 or 4925 or 868-7427. AMERICAN LEGION AUXILLARY: At 4:30p, at 803 13th St.
STORY TIME: At 10:30-11:30a, at Library (Children's area), 1118 Main. www.blancolib.org. 830-833-4280. Ages 3 to 6 are welcome! RANCH, SCULPTURE & FIBER TOUR: 11a & 1p, at Old Oaks Ranch Fiber Arts Center. www.theoldoaksranch.com. 512-847-8784. See the Alpacas, Sculptures, and fibers. Learn about where alpacas come from and how they spit, how an artist takes an idea for a sculpture to a finished bronze piece, and how to make yarn from that furry beast and turn it into cloth. BLANCO MARKET DAY: 9a-4p, at Old Courthouse Square on US 281 in downtown, April-Nov. www.historicblanco.org, 830-833-2211. Arts, crafts, antiques, food, and much more. Plus special December Christmas Market Days event. BLANCO RODEO ASSOCIATION MEMBER'S MEETING: At 7:30p, at Yett Park Arena. Late Feb: BLANCO ALL SPORTS BOOSTER CLUB FISH FRY: BISD Baseball Field, at 4-6p. Meal, raffle, prizes. Early March: TEXAS STAR TRAIL RIDE: www.texasstartrail.com. A 107 mile horse ride the original Texas Star Trail through Fredericksburg, Luckenbach, Stonewall, Johnson City, Blanco, Fischer, Wimberley and Driftwood. Early Mar: BLANCO MARDI GRAS: At Uptown Blanco Courtyard. 6p-10p. www.uptownblanco.com. Cajun food, live music, Mardi Gras costume contests, fortune telling, tarot card reading, king and queen contest, and many more fun activities will be offered for one entry price. Fun for the entire family! Early Mar: GUARDIAN TITLE MARDI GRAS: At Guardian office, 508 8th Street. 11:30a. Stop by for some King Cake, gumbo, and other surprises! Early April: BLANCO TRASH-OFF DAY: First Sat, a Keep Blanco Beautiful event. Retta Martin, 830-833-4270. First Sat in April. Early April: BLANCO VFD FISH FRY: Fundraiser, raffle. Early April: ST. MICHAEL'S EPISCOPAL CHURCH CLEAN SWEEP RUMMAGE: At 218 Pittsburg St.; Fundraiser for BC Young Life. Sat 8a-2p. Late-April: SUNDAY COMMUNITY EASTER "SON RISE" SERVICE: At Yett Park located just S of town. At 6:30a. Stay for a time of fellowship and breakfast tacos. Late-April: BLANCO HISTORIC CEMETERY ASSOCIATION: At Blanco Library. Annual meeting, public invited. At 6p-8p. Early May: BLANCO RODEO PRO BULL RIDE: At Yett Memorial Park, 1813 Hwy 281, S of town. 7a-11p. Dance. $10. Mid-May: BLANCO CLASSIC CAR SHOW: At 42 Main St, along the banks of the Blanco River, in Blanco State Park. 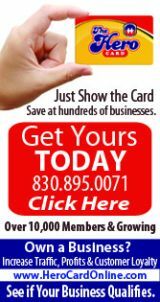 Blanco Chamber of Commerce: 830-833-5101, www.blancochamber.com. 3rd Sat in May. Mid-May: REAL ALE BIKE RIDE: 512-477-3472. www.realale.com. Supports Blanco Community and the Ronald McDonald House Charity. The route will take you through gentle rolling hills ranging in distances from 15, 30, 50, 65 and 80 miles. Volunteers needed. Mid-June: RELAY FOR LIFE OF BLANCO COUNTY: Sat, 3p-3a, at Blanco High School Football Field. American Cancer Society, Wendy Smith, POB 269, Johnson City, TX 78636. Annual fundraising event. www.cancer.org/relayonline, Sylvia Romero, 512-461-6337. Mid-June: BLANCO LAVENDER FESTIVAL: At Courthouse Square. 830-833-5101. www.blancolavenderfestival.com. Blanco is the Lavender Capital of Texas and holds a great "Lavender Festival" each June with vendors, displays, tours & entertainment. The entire town the surrounding countryside will be bathed in lavender during the Festival. The Lavender Market, on the grounds of the historic Blanco County Courthouse, is always a must-see highlight of the festival. Selected vendors and artists from across the Hill Country offer lavender-related pleasures and treasures from the finest craftsmen. Late July: BLANCO CHAMBER SUMMER MIXER: 830-833-5101. www.blancochamber.com. Early Oct: LADIES STATE CHILI CHAMPIONSHIP OF TEXAS: At Yett Memorial Park, 1813 Hwy 281 S. Annual event. www.ladiesstate.org. Free admission. Mid-Oct: OLD BLANCO FAMILY FESTIVAL: At Old Courthouse. 830-833-2211. Free annual gala event. From 1-4p. Designed for kids and families, includes special appearances by the Texas Rangers who will perform a re-enactment of the famous shoot out with Sam Bass and will issue Ranger Deputy badges to kids attending. Special Storytelling Area will feature stories about historical Blanco, demonstrations about the life and times of early pioneers will be presented courtesy of Pioneer Park in Johnson City, and special roping tricks will be performed. A pumpkin patch will be set up with over 100 pumpkins available for sale and some will be given away free to kids. Special Halloween mask making courtesy of the Uptown Blanco Arts Center. Washer-throwing contests and food vendors. Mid-Oct: BLANCO CHAMBER OF COMMERCE GOLF OPE: At Vaaler Creek Golf Club (Rockin' J Ranch). 830-833-5101, www.blancochamber.com. Open to Members and Nonmembers. Four-man scramble. Noon shotgun start. Don't play golf? Attend a Golf Clinic and Putting Contest!! Mid-Nov: AMERICAN LEGION VETERAN'S PARADE: At 10a. Help us honor our veterans on this day. To participate in the parade, contact Roxann Avants @ 512-627-0584 or Bruce Huguelet @ 830-833-5211. Join us as a spectator - parade begins at 10am in Blanco. A fundraising dinner will be served by The American Legion Post 352 immediately following the parade @ Bindseil Park, next to City Hall. Mid-Dec: BLANCO CHRISTMAS PARADE. Downtown. 830-833-5101. www.blancochamber.com. Floats, prizes, Santa, Holiday Market Days at Old Blanco Courthouse lawn. Late-Dec: "RING OUT THE OLD ! BRING IN THE NEW" CHILI/BBQ COOK-OFF AND BLANCO TRADE DAYS: Supports The American Legion Memorial Highway Post 352 in Blanco. New Year's Eve various craft vendors will set up from 10a-8p; New Year's Day they will set up from 9a-3p. The American Legion runs the snack bar. This event is free to the public. Come out and join the fun, taste some of the fine fix'ins, and enjoy the music and fireworks at midnight New Year's Eve. Vendor information: Donnea Simon at 830-833-4460. NOTE TO EVENT ORGANIZERS: Please submit your event notifications by email to: info@hillcountryportal.com, and as early as possible. Be sure to include event web site address, event dates, location, description, contact person's name, email address & phone number. You are welcome to submit a more detailed description which we may be able to post as a clickable item.